Well, I thought today’s post was going to be a bit of a challenge. My ear infection has ramped up to excruciating pain and my doctor sent me to hospital. Guess what? There was lots of joy to be found. This morning, before I felt really crook I reconnected with a former colleague who I’ve known, working together in various places, since 1986. I hold her and her talents and skills in the very highest regard. It was great to talk to her again. She’s the greatest get-things-doner I have ever known. In that short conversation she gave me the most brilliant tip which will make updating this blog so much simpler – download the WordPress app and do it all on the iPad. This is Facebook at its best. Back to the lug ole. I have the most wonderful doctor. She’s very glamorous – always wears a fab dress and heels to the surgery – and very funny. The whole practice is fantastic. The reception area is shut from 1pm, when I needed to get my referral letter and we arranged that I would stand underneath the open window and shout up to them. ‘Romeo, Romeo,’ I called out (I know that’s Juliette’s line from the window, but it has better comedic value than ‘Lo, what light from yonder breaks?’ so I went with it). Out popped a smiling head and down came my letter. My husband was able to get away from work to take me to the hospital. He made me laugh so much on the 40 minute drive, I was bent double. I don’t know if the ENT specialist who saw me meant to be funny but I had an extended fit of the giggles when he inserted a camera right up my nostril and into my sinus. It wasn’t very pleasant but there was just something so droll about him. On the way home we stopped to buy some food in Sainsburys. 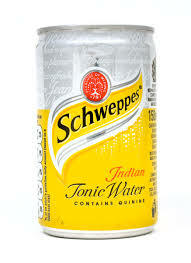 Tonic water was purchased. And a quantity of gin. This blog reminds me of http://1000awesomethings.com/ this blog. Thank you.